...with precision launches, over various currently used French firing ranges, of reduced bombs having exactly the ballistic characteristics of the AN-52 tactical nuclear bomb. 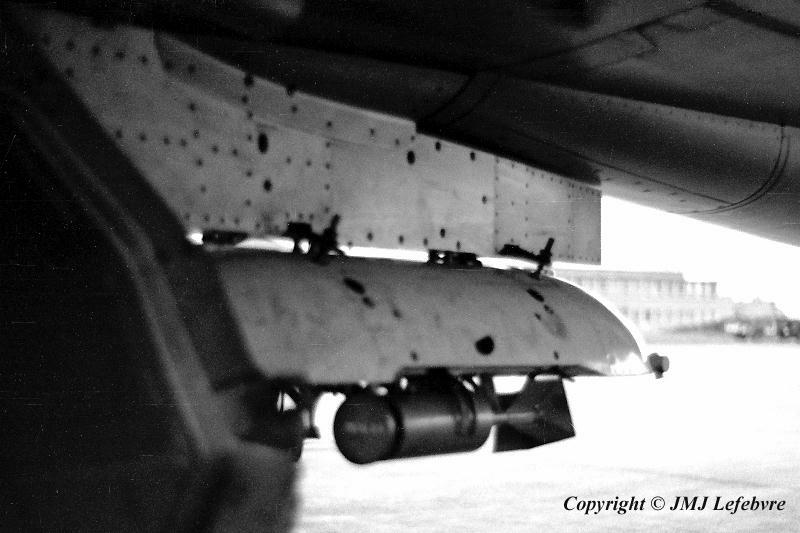 This is the smallest negative part I scan to give, with greatly exagerated light and contrast, an as good as possible picture of this exercise bomb fitted to a secondary launcher held by the long adapter beam installed under belly. Modifications were necessary under fuselage to accomodate the AN-52 bomb: two or three extra points were added to fix the bomb rack as so as changes wiyh shape and length of the rear ventral queel including a 500 liters fuel tank. It seems that a part of the work was made directly in the repair and overhaul works of 4th FW and that last delivered aircraft were already modified either on assembly line by Dassault or by AdlA Works.